Q: Is Immortan Joe The Toecutter from the original movie? Q: How are all the Brides kept to look like super-models in the wasteland? Mad Max Fury Road is a stunningly beautiful and highly charged kinetic thrill ride. It is brilliantly filmed with amazing, and well suited bombastic soundtrack. The star of the film is its direction by George Miller, showing generation MTV how to direct moving action without getting lost in its mayhem. Almost every shot is moving, similar to a James Cameron action sequence. As mentioned before the film has not got much of a plot other then a giant chase. The first half of the film is great and the second half starts to loose steam due to what has come before it. Chalize Theron is great and adds presence to the film, it is one of her best performances. 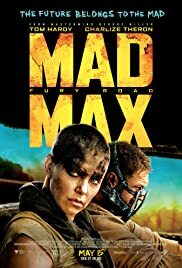 Tom Hardy gives a solid performance but I found his performance somewhat lacking, he does not have much to work with and is limited to a handful of dialogue, I preferred Mel Gibson's Max. The film suffers when it eventually slows down in pace, but when it is going full throttle there are not many films that can complete with it. Is it an action classic? as a chase film , yes I would say it is, along with set design and stunt work involved But the lack of any real story and small plot holes stop me giving this film a 10, not much is explained in the film. The ending seems sudden and could of done with some more depth to it, especially the Max character. 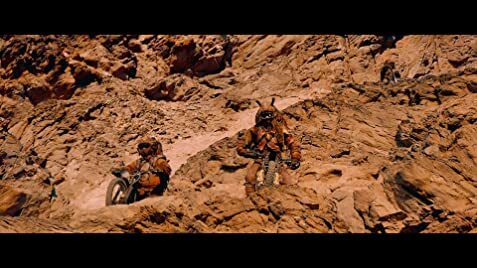 It is still a wonderful and refreshingly directed film to add to the Mad Max Cannon of films.